Holiday travel is just around the corner. And, whether jetting to southern California with Katrina or road-tripping to Boston with Lindsay, wearing something comfortable and chic is key. Over the years, we’ve experimented with every travel look—jeans and heels, sweats and sneakers, and the worst—conservative suits and over-the-top LBDs (the only excuse for which, we’ve concluded, is straight-off-the-plane and into-a-business-meeting necessity). What works? 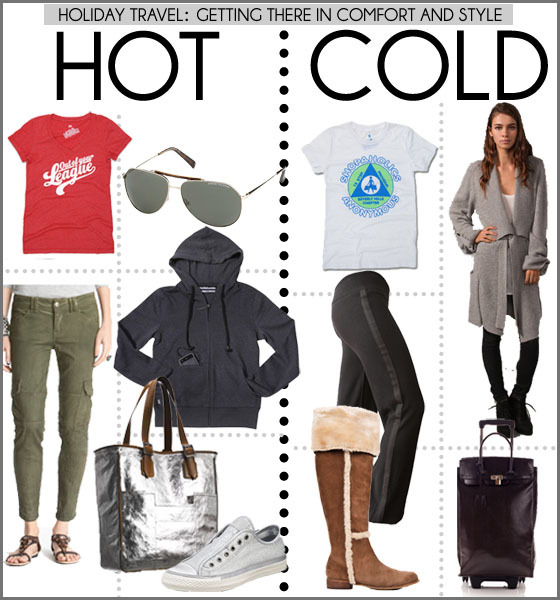 Start with pants and a cute tee, then choose shoes and an extra layer to suit the weather at your destination. If you’re our partners in travel-fashion crime, ditch your faux-pas ways and shop our new favorite travel-friendly pieces. And repeat after us: We will not sacrifice style in the name of comfort! Don’t forget our favorite travel beauty products to keep you looking gorgeous on the go. Two sisters with very different personal styles design the jewelry line, Dannijo, a favorite of stylish celebs like Natalie Portman and Beyoncé. Meet them and take a peek at their showroom with Melissa Meyers, who checks out their gorgeous collection and gets styled by the sisters themselves!